Following the Battle of Lexington and Concord, the British soldiers returned to the relative safety of Boston. The commander, General Thomas Gage, was concerned about the city’s vulnerable position, lying as it did in the shadows of surrounding hills. The wisdom of securing those heights was considered, but not acted upon. Word of the bloody encounters in Massachusetts was received with astonishment in England. Edmund Burke, one of America’s most ardent supporters in Parliament, expressed a minority view when he urged the withdrawal of soldiers from Boston. His plea made little headway with Prime Minister Lord North, who dispatched additional soldiers to the rebellious colonies. Further, North hoped that a more aggressive British response would result from new military leadership and sent three generals, William Howe, Henry Clinton and John Burgoyne. These forces arrived in Boston in May 1775. On June 16, colonial soldiers under Colonel William Prescott were sent onto the Charlestown Peninsula to occupy Bunker Hill, but for reasons that are not entirely clear, they took possession of neighboring Breed’s Hill. The Americans worked through the night constructing extensive earthworks for their protection at the crest of the hill. On the morning of the 17th, the British command in Boston was shocked to see a colonial army putting the finishing touches on their fortification. The Americans continued their labors until midday despite bombardment by British ships below. Clearly the best strategy for the British at this point would have been to seal off the Charlestown Peninsula by taking control of the Neck. That move, accompanied by a naval blockade, would have starved out the American force in short order. The British commanders, however, felt a strong need for aggressive action. At about 3 p.m. General William Howe led a force of 3,000 soldiers ashore near Moulton’s Hill south of Breed’s Hill. 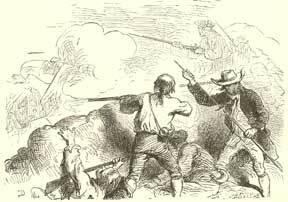 After a short march to the foot of the American position, the redcoats launched two uphill assaults against the entrenched colonists. Colonel Prescott reputedly cautioned his men not to fire until they saw the whites of their opponents’ eyes. Both assaults were repulsed and resulted in very heavy losses for the British. Action ceased for an hour while Howe counseled with his subordinates and awaited the arrival of 400 additional soldiers. A third charge found the Americans running low on powder and unable to resist the fixed bayonets of the British. Prescott grasped the hopelessness of the situation and gave the order to retreat. American soldiers fled down the north slope of Breed’s Hill and sought escape across the Neck. Many were shot in the back during this retreat, including Dr. Joseph Warren, who was among the last to leave his position and was killed instantly by a musket ball in the back of his head. The fighting on the Charlestown Peninsula resulted in 1,054 British casualties, their heaviest toll of the war; the Americans suffered 441 casualties, most of them during the retreat. Despite these losses, there was little military consequence to the battle. Nothing had really changed. The American army still encircled the British position in Boston, the only difference being that the colonists were a bit farther away. George Washington had been named commander-in-chief of the Continental Army on June 15 and was en route to Massachusetts when the fighting occurred. He assumed command on July 3 and then devoted months to the organization and training of the soldiers. In early March of the following year, Washington occupied the area known as Dorchester Heights south of Boston. The cannon taken from Fort Ticonderoga were installed here and commanded much of the Boston waterfront. Howe realized that his position in the city was again untenable; he was occupying a city that was impossible to defend and was located in the heart of enemy territory. On March 17, 1776 the British army and 1,000 Loyalists evacuated Boston by sea and headed for more welcoming surroundings in Halifax, Nova Scotia. Quotes regarding Battle of Bunker Hill. Men, you are all marksmen -- don't one of your fire until you see the whites of their eyes. The Whites of Their Eyes: Bunker Hill, the First American Army, and the Emergence of George Washington by Paul Lockhart. Decisive Day: The Battle for Bunker Hill by Richard M. Ketchum.